I have finished the advertising flyer for the exhibition and it is now going to print. You can view it online by clicking on the image. Picked this one up on Guy Kawasaki’s blog this morning. He quotes an article in the UK Daily Telegraph about a Manchester band called “Get Out Clause” who played their music in the street in front of the around eighty CCTV surveillance cameras around their city and then edited up a video of the result. They needed to request the footage from the businesses who owned the cameras but about a quarter responded and that was enough to make the video. What I wonder is what passers by thought of this and especially when you see them playing in the middle of a zebra crossing (crosswalk for the Americans)…..
Another cool art opportunity afforded by the 21st century. 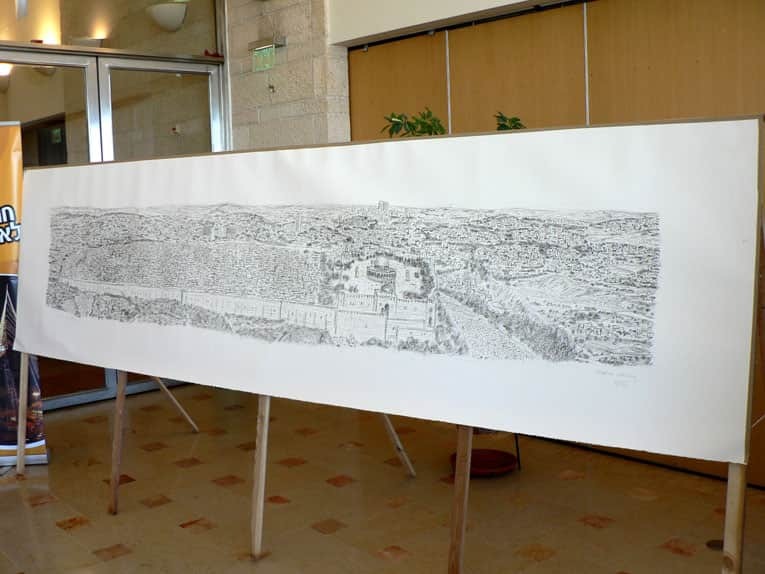 CNet reports this morning that the biggest drawing in the world was just a hoax. The purported art project was to fly a GPS device around the world and create a massive drawing from the track of the device. Keen eyed and intelligent commenters on previous articles on this subject both on CNet and other places had pointed out the total improbability of the project. However it’s still an interesting idea – new artistic medium. I saw this video today (sorry but most of it is in Hebrew) about Stephen Wiltshire who draws amazing panoramic drawings of cities around the world from memory. The image below shows the finished work and if you click on it you can go to his site to see his gallery. Stephen apparently suffers from autism but has an amazing memory and a talent for art and he makes what looks like a good living from drawing. Good on him! Last Thursday night was Lag BaOmer. This is the 33rd day from the festival of Pesach and is held by tradition to be amongst other things the day that Rabbi Shimon Bar Yochai died. He is acredited as having written the major mystical work – Sefer HaZohar (literally “the book of luminance”). As a result there is a widespread custom of lighting bonfires and sitting round them doing unmystical things like eating roast potatos and marshmallows. If there is an opposite to greenness then Lag BaOmer is it. I suppose you could call it a red festival (red being the complementary color to green). Large amounts of waste (and not so waste) timber get collected by packs of marauding teenagers in the weeks leading up to the festival in order to burn them all night when it comes. And I haven’t spoken about the air quality the next morning….. But anyway, why be a killjoy? Let’s spend the rest of the 364 days of the year being green. After we’ve done that we can start on curbing the excesses of things enshrined in our culture that give enjoyment and meaning to our lives. This is the announcement I promised earlier this week. Yesterday I concluded the details with Haim at Nofim for my solo exhibition. The exhibition will open on Thursday 3rd July and run till 15th July. There will be an opening night on Thursday 3rd July from 18:00-20:00, where you will be able to mix and mingle with the many guests who will doubtlessly be there 🙂 and meet and talk with me in person. So now I have loads of work to do. I have to write lots of PR stuff, prepare and print flyers (that is part fo my deal with Haim), email, post, talk, beg, cajole…. I have made myself a project plan in MS Project (geek!) and I am making a list of artifacts to prepare, tasks to do. Busy time. Yesterday I had the best falafel I have had in many years. In fact it was so good, I just felt I needed to blog about it and let the world know. I had mine in a pita. My son had a lafa and there were considerably more falafel in the lafa than in the pita (which is a rare thing – and the reason I normally go for the cheaper and theoretically smaller pita). While we were standing in line the guy serving behind the counter gave us each a falafel ball on the house to build up our anticipation. So where is this great falafel stall? It is in Talpiot in Jerusalem and the map here shows where to find it. Opposite Kanyon Hadar there is a long building set back from the street with parking in front. It is the one with a matress shop at the far left end, a craft supply store and a hardware store at the right end. In front of the parking on the street there are two stalls – one Burgers Bar on the left and the other the best falafel in the Middle East (well maybe I’m getting a bit carried away there) on the right. The red/yellow circle marks the spot.